The conflicting feelings that come at the end of or change in a familiar pattern of behavior or life. The feeling of reaching out for someone who has ALWAYS been there, only to discover, when you want/need them one more time, they are not there. The feeling of reaching out for someone who has NEVER been there when/how we needed them, only to discover, when you want them one more time, they are STILL not there. The result of undelivered communication: things we wish had ended different, better; or more; the loss of hopes, dreams and expectations. Losses: Death, divorce, health, career, faith etc. Major changes: Retirement, a major move, marriage, pregnancy, even a promotion, a job change, the new dream house… – yes, conflicting feelings accompany negative as well as positive change in life. And if not processed, the feelings we push down, ignore or skip over, can result in lingering effects from unresolved grief. 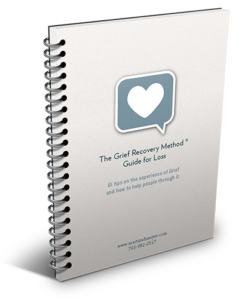 The Grief Recovery Method provides a step-by-step guide with the specific actions needed to move beyond the sense of loss in any of these situations. Do you have a new insight that moved, touched or inspired you? Was there anything in these definitions that was new to you, and brought a sense of relief – if so, what was it?